A pair of sports tickets from 1927 are discovered in a used book. The tickets are for a basketball game featuring Jim Thorpe, the legendary Native American athlete who was known for his 1912 Olympic gold medals and Herculean strengths as a football and baseball player. 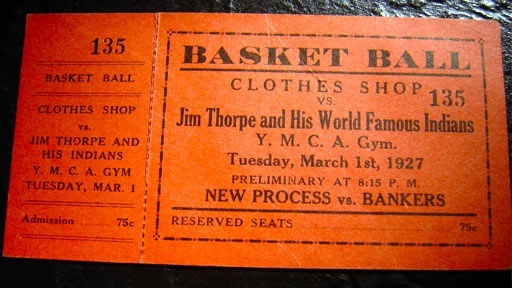 Thorpe’s sporting legend looms large, but is this ticket evidence of a chapter of his career almost completely forgotten by history... as a professional basketball player? History Detectives goes to New York and Pennsylvania to investigate the life of a sports legend and uncover some harsh truths about racism in the sports world. Also in Emerging Modern America: 1890-1930 NC-4: First Across The Atlantic Is this piece of fabric a remnant from the first transatlantic flight? Related Investigation Fillmore Pardon Did President Fillmore pardon a Native American convicted of murder? Also in Emerging Modern America: 1890-1930 Yakima Canutt's Saddle What leading role did this saddle play in the birth of the Hollywood cowboy?